If you have a furnace in your house, you need to know about your heat exchanger. If you have a technician in your home, it’s probably common for them to throw around technical terms and parts—if you’re not sure what the terms mean, don’t be afraid to ask! It’s important to understand the systems used in your home. We would never categorize a furnace system as “dangerous,” but these systems can definitely become this way if you neglect them. When you need heating repair services in Staten Island, NY, make sure they’re from a responsible team like ours. You need quality work so don’t cut corners! What Does a Heat Exchanger Do? You might wonder, “Well, what does a heat exchanger do exactly?” And you wouldn’t be alone in this thought. The difference is, most homeowners only start to ask this question when something has gone wrong with theirs so you’re a step ahead already! Heat exchangers transfer heat throughout your home safely. If you’re like the vast majority of American homeowners, then your furnace uses natural gas through the combustion process. This combustion process creates heat for your home, which is then blown by the fan throughout your ductwork. Your heat exchanger is somewhat of a safety net—if something goes wrong with the combustion process and your heater starts to emit carbon monoxide, the heat exchanger prevents it from entering your home. Flame Color: Your gas furnace should always have a steady blue flame. If you see anything other than that, it either means that your burner is dirty or that your heat exchanger is cracked. Either circumstance is grounds to call a service professional. Soot: If you see any soot on your heat exchanger it means your furnace is unable to burn cleanly. The burners are either cracked or improperly adjusted. 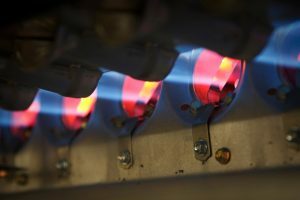 An Unpleasant Scent: If you notice that your heat exchanger produces a bad smell in your home then you should contact a professional sooner than later. This scent could indicate dangerous problems. This is especially true if you’re having physical side effects like headaches or nausea. Our team here at Scaran is a step above other HVAC contractors because of our extensive experience. We’ve been in business for 90 years here in Staten Island, and throughout our long history in business, we’ve cultivated our practices so that they’re as efficient as possible. When you choose our team, you won’t have to worry about the quality of the work you’re receiving. Instead, you’ll know that you’re getting the best possible job done the right time the first time. A cracked heat exchanger in your home is a big problem, so make sure that you contact a professional heating team as soon as possible. Our team at Scaran has a reliable team of technicians that will make sure that your home is always comfortable in cold weather.